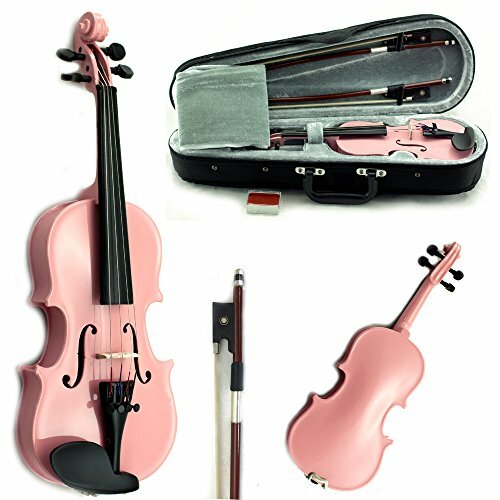 This is a very beautiful bright pink 1/10 SKYVNSM100 children violin package that comes complete with 1 Brazilwood bow, 1 lightweight triangular violin case and 1 high quality rosin. This violin is professionally set up and ready to play, featuring solid wood top and solid wood pink oil varnished back, sides, neck and scroll. This violin has beautiful purfling, and pegs, fingerboard and chinrest are made from solid wood. Durable aluminum tailpiece comes with four high quality built in fine tuner. Lightweight case has rain proof canvas exterior and shoulder straps with sheet music pocket and accessory compartment. High quality Austrian rosin cake is included. Bow has double pearl eye, genuine unbleached Mongolian horsehair. It also comes with a new fitted bridge and high quality strings. Great sound, perfect gift for children start learning violins. Size suggestions: Age 4 yrs old with an arm length of 15 3/8" to 17"
Beautiful bright pink 1/10 SKYVNSM100 children violin package that comes complete with 1 Brazilwood bow, 1 lightweight triangular violin case and 1 high quality rosin. This violin is professionally set up and ready to play, featuring solid wood top and solid wood pink oil varnished back, sides, neck and scroll. Bow has double pearl eye, genuine unbleached Mongolian horsehair. ROSIN Need to be applied for the first time use, VIOLIN WILL NOT PRODUCE SOUND WITHOUT ROSIN.